In a broad sense, correctional and human service agencies often have different roles and priorities that can impede the implementation of family strengthening efforts with incarcerated and reentering fathers (Festen et al., 2002; Nurse, 2004; Rossman, 2001). Correctional institutions prioritize public safety, which carries an emphasis on controlling all movements and activities within their facilities for the protection of inmates, staff, visitors, and the public (Lawrence et al., 2002). Human services agencies, by contrast, emphasize meeting the needs of their clients, which necessitates a focus on individual well-being and self-determination (Rossman, 2001). Whereas corrections policies attempt to encourage responsible behavior by imposing penalties on offenders, fatherhood policies encourage fathers to take responsibility for their children and suggest programming that support this goal. These approaches can come into conflict with one another, for instance discouraging efforts to pay child support by deepening fathers’ debt while in prison (Nurse, 2004) or impeding fathers’ ability to stay connected with their children by limiting contact and visitation while in prison (Jeffries et al., 2001). Correctional institutions’ emphasis on safety and control and human service agencies’ focus on client support may clash during service integration. Because most prison-based programs are provided by external community-based organizations (CBOs) that focus on service provision, it is necessary for these organizations to build partnerships with correctional and probation/parole agencies and to develop a shared vision of the program. 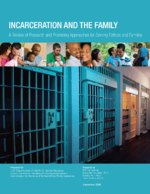 Support for family programs must be secured from the corrections systems and personnel, including state-level officials, facility superintendents, and correctional officers, in order to promote successful implementation (Adalist-Estrin, 1994; Eddy et al., 2001; Jeffries et al., 2001), but corrections facilities have been generally unsupportive of family-oriented services (Eddy et al., 2001). Correctional institutions need to be willing to open their facilities to outside organizations (Rossman, 2001), but it may be difficult for CBO staff to gain entry to correctional facilities due to lengthy background checks and limited time and space availability. Prison rules may also be enforced inconsistently or without obvious rationale, which can be challenging for outside staff (Jeffries et al., 2001). Additionally, elements of programs such as content, activities, duration, location, and number of participants may be limited by constraints of the prison environment and policies as well as the strong emphasis on prisoner security (Jeffries et al., 2001). On the other hand, community-based service agencies are often located far from prisons and may not consider inmates as potential clients or may not be aware of services available for inmates (Rossman, 2001). In addition, partnerships between CBOs and correctional agencies often create numerous record-keeping and information-sharing challenges, as data-sharing agreements are difficult to establish and correctional agencies typically do not have staff time designated for generating reports or other information to be shared with CBOs delivering programs (Rossman, 2001). Staff turnover at correctional facilities and CBOs also makes the maintenance of stable partnerships and the delivery of consistent programming difficult (Lawrence et al., 2002). Thus, more coordination between corrections agencies and the organizations responsible for implementing family strengthening programs could improve the quality of prison-based programs. For instance, one approach that could facilitate understanding and buy-in is for program development and delivery staff to provide presentations to corrections staff regarding project rationale and activities (Eddy et al., 2001).